I've been using single side double eyelid stickers for almost half my life and am always on the look out for better eyelid stickers. When I was told to do a review on AB eyelid tapes, I immediately went to google other reviews online and everyone had such good things to say about it. It made me so excited to try em'! What do you look for in an eyelid sticker? Personally, I have 2 main concerns. It needs to have a strong hold and not be too visible. Seems pretty simple, but I have tried more than 20 brands of stickers, fibres, glues, etc. and I can safely say that NONE have both of these crucial aspects together. If it's invisible, it doesn't have a strong hold. Vice versa. Tbh, I was expecting it to lose it stickiness after a couple of hours but erm... it has been on my eyelids for the past 48 hours and still going strong. Double U Tee eeF, I KNOW RIGHT. I have my eyelid stickers on 24/7 and I don't remove em' unless they drop or lose their stickiness (BAD HABIT ALERT) but I don't see the need to change em' cos I don't draw or put anything on my eyelid stickers. Not saying this only because it is sponsored but it is prolly the best eyelid sticker I have ever used thus far. Though I have to admit it is slightly pricier than other stickers but you get what you pay for, right? It costs SGD$19.90 for 80 strips! 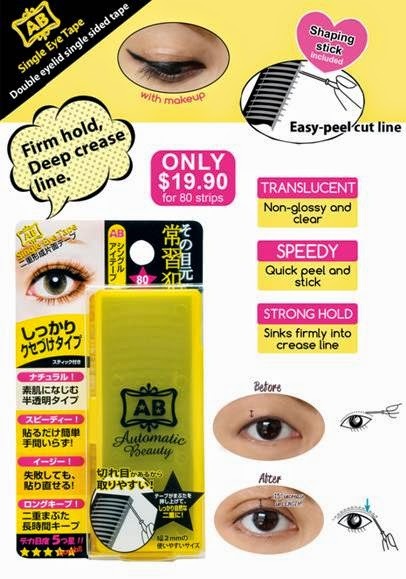 AB Double Eyelid products are exclusively available at all SASA stores in Singapore! Stay tune for my next review on their Natural Eye Tape!